When I entered the theater, I was early, and the theater was empty. I wondered if it would remain empty. After all, I, who am always on the lookout for interesting perspectives on faith, had just heard about the movie a few days ago. I wondered if others had heard of it. It is playing only in AMC theaters, in a few select theaters, from September 9th through September 15th. The theater filled up – with a multi-racial group of people – many who appeared to be Muslim, myself, an elderly Caucasian lady, and a few families with children – of various races. By the time the lights went down and the previews started,there was a pretty hearty group of people in the theater. After a day watching 9-11 tributes on the news, and contemplating the terrible things that can happen when religion is wielded as a weapon, it was, for me, a fine way to end this September 11th , remembering that good people of all faiths have the right to live life in peace, and not have their lives tainted by a small minority of those who would be considered to be evil, no matter what religion they profess. Having the opportunity to peek into the daily lives of Arab-Americans, living in Dearborn, Michigan, elicited a number of emotions from me. There was the thrill of athletic competition, the heart wrenching stories of unwarranted discrimination and racism, and the devotion of those Americas who just want to have the opportunity to live their lives, protect their family, live the American Dream, and play a little football. 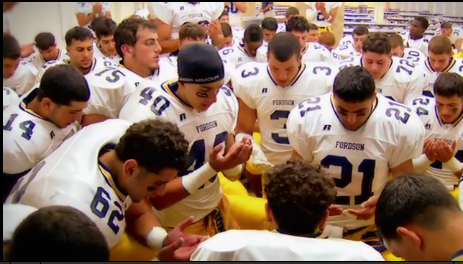 Although the movie was about Fordson High, I thought that one especially moving portion of the movie came when we saw the football team Fordson’s cross-town rival, Dearborn High pray before the game. First, the Muslim players recited the al-Fâtiha prayer…then their Christian teammates recited the Lord’s prayer. As each group prayed, those that did not practice that religion stood silently, respectfully. I imagine that some team members chose to say neither. But that portion of the movie showed how we can stand shoulder to shoulder, with different beliefs, and respect each other, if we so choose. Below is the trailer for the movie. I highly recommend it.